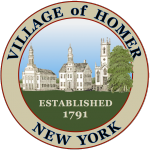 Plenty of free on-street parking is available along Main Street so that you can enjoy the attractions the Village of Homer has to offer. There is no parking on village streets or in these lots from 2:00 am – 6:00 am. Cortland Transit provides fixed route bus service in Cortland, Homer and Cortlandville on 30 minute intervals between 6 a.m. and 6 p.m. Monday through Friday. A lift-equipped bus for wheelchairs is provided on all fixed routes. Also, door-to-door service is available county-wide through the Dial-a-Ride system. Note: Accessible taxis available; please call to schedule.